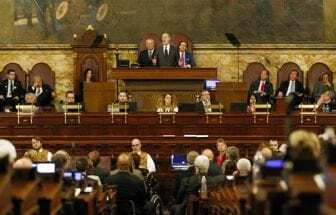 HARRISBURG, PA (WSKG) — With 253 members in the House and Senate combined, Pennsylvania has the largest full-time legislature in the nation. That prompted PA Post reader Brendan Mangan to write to our Listening Post with both a gripe and a question. Having 203 House members, he said, is “ridiculous.” He asked, can’t lawmakers cut their numbers to 125? It so happens, they can. But whether they will is a different matter. For the last four years, Representative Jerry Knowles has been pushing an amendment that would cut House membership from 203 to 151. It wasn’t a new idea; Knowles inherited the bill from former House Speaker Sam Smith when Smith left office. But Knowles’s version got closest to becoming law. Last year though, Knowles couldn’t muster enough support to get it over the finish line a second time. Knowles said his basic argument is that voters should be given a chance to decide their legislature’s size. But aside from that, he has long held that a smaller general assembly would be cheaper and more efficient. His opponents tend to say downsizing wouldn’t make a big enough difference in cost or productivity, and they argue that representatives can engage better with constituents when districts are smaller. Last session, Knowles estimated his bill would have saved around $15 million—a relative drop in the bucket compared to the commonwealth’s $32 billion operating budget. As far as productivity goes, experts say studies on the subject have been inconclusive. Ultimately, she said the appropriate size for a legislature seems to have more to do with expectation and tradition than any objective measure. For his part, Knowles is still mulling whether to keep trying to shrink the chamber. He’s considering tweaking the bill—maybe shrinking by 28 members instead of 52, delaying the effective date, or cutting members gradually. Whatever happens, he said he’s not quite ready to let go of the fundamental idea. “I just think it’s good stuff,” he said.